- Last week was Homecoming Week, and even though it was super stressful it was also a lot of fun. 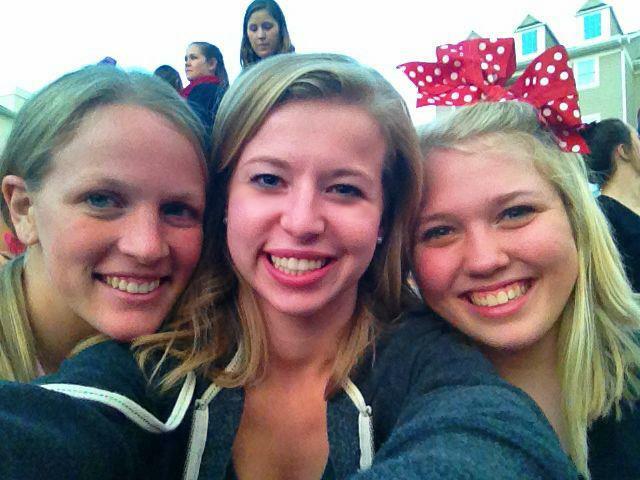 I got to bond with my fellow Gamma Phi girls, and I enjoyed going to all the events to support my sorority. Me, Katie, and Rachel waiting for the Pep Rally and Yell Like Hell to start. - Big/Little Week is this week!! Tomorrow begins a 4-day present extravaganza, and I finally get to know who my Big is on Saturday. I have been looking forward to this week since Bid Day. - It looks like Bryan is coming home this weekend, so I'll get to see him which I wasn't expecting at all. - My 21st birthday is less than a month away! - Next weekend I'm going to Helen, Georgia for Oktoberfest as a Berlin reunion. - I'm still excited about all my new furniture for my apartment. - My stepbrother is getting married the day before my birthday. - I also have a new car waiting for me back home. - I'm going to Ohio for Thanksgiving, and I'm so excited to see my family. - Then the semester will be over before I know it! And now I feel much better about this awful semester. I'll be done with these classes soon enough, and I get a fresh start in the spring. But in the meantime, I've got a couple months of excitement ahead of me, and there is no way I'm going to let school bring me down. I can do this.